Voters are being asked to approve additional funding for transportation in November, which could help pay for safety improvements along U.S. Highway 160 between Elmore’s Corner and Bayfield. 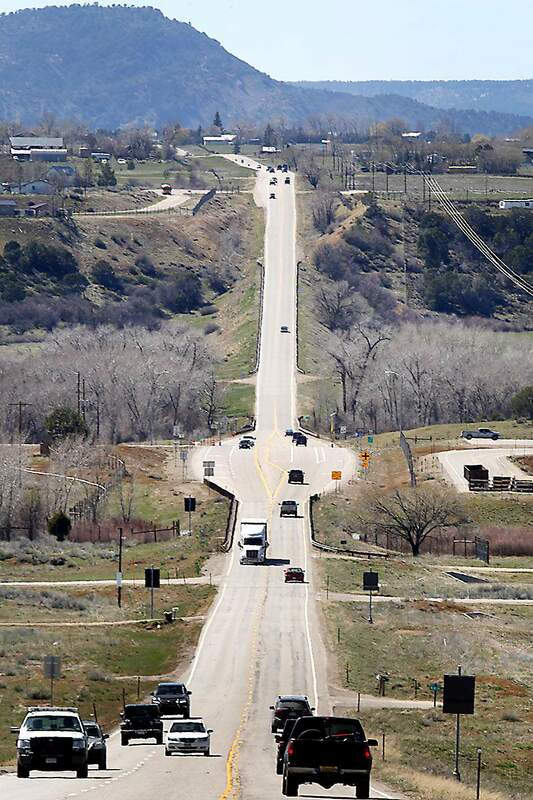 U.S. Highway 160 from Elmore’s Corner to Bayfield needs turning lanes, wider shoulders and other safety improvements that will require between $55 million to $65 million to build. The Colorado Department of Transportation doesn’t have funding for the project, but it is one the department has identified as a being a priority, said Tony Cady, CDOT planning and environmental manager. “When the number of vehicles is peaking, this corridor can become very congested,” he said. Funding for the improvements between Elmore’s Corner and Bayfield could come from ballot measures Colorado voters will decide in November. Different versions of the project are included in both ballot questions, he said. Bayfield resident Doty Shepard, who drives into Durango twice each weekday at a minimum, agrees the road needs to be widened. “When I moved out to Bayfield 20-some-odd years ago, I though it was on CDOT’s radar then,” she said. Two travel lanes in each direction and a center turn lane would help alleviate traffic congestion, she said. It is particularly dangerous when drivers have to stop traffic to turn left, Shepard said. “I can’t tell you the number of times I’ve almost been hit,” she said. Cady said exact details about design, construction and duration of construction to improve the corridor have not been determined. But some of the potential improvements could include passing lanes and a center turning lane to allow drivers to safely turn left, he said. CDOT also plans on a wider road and shoulders that would allow drivers to safely pull over and reduce the possibility of crashes, he said. Bayfield resident Vaughn Morris said he would like to see wider shoulders along the corridor for emergencies and disabled vehicles. In one instance, he witnessed a car hit a deer and then saw a responding state trooper fall chest-deep into the snow on the side of the road trying to help, he said. Morris said he appreciates recent CDOT improvements, including some new turning lanes near Bayfield, but work remains to be done that would benefit everyone. “It’s still pretty crazy at times,” he said. The addition of another large-game wildlife underpass could be part of highway improvements, but it is unknown where it would be built, Cady said. Improvements to the Florida River bridge could also allow wildlife to pass through without interfering with traffic, he said. “Area residents have witnessed and may know and understand that the seasonal and daily movements of deer and elk create significant safety issues for the traveling public,” he said. The two ballot measures voters will consider that could fund improvements to the corridor would be funded differently. If approved, Proposition 109 would require the state to use its surplus funds and reprioritize spending toward road infrastructure. The measure would grant the state $3.5 billion in bonding authority to be paid back over 20 years and require 100 percent of the money to be dedicated to state funding, he said. But it would leave $2 billion in projects unfunded, Cady said. Proposition 110 asks voters to raise the state sales tax by 0.62 percent (6 cents per $10 purchase) for 20 years. The new revenues would be divided three ways: 45 percent would go to state projects, 40 percent would fund city and county roads and 15 percent would fund public transit, bicycle and pedestrian projects. Funding for transportation in the state is tight because the revenue is generated from a 22-cent-per-gallon tax on gasoline that has not gone up since 1991, Cady said. Fuel-efficient vehicles, population growth and inflation have all cut into how much work CDOT can do with its $1.6 billion annual budget, he said. It is estimated CDOT could face a $25 billion funding gap over the next 25 years, Cady said.